Neustaedter’s has been offering expert fine jewelry watch repair for more than 50 years. 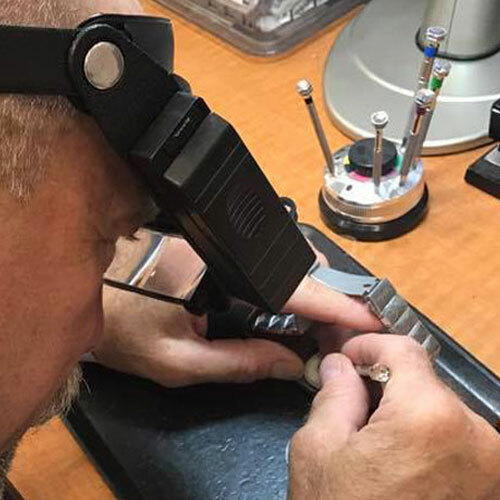 If it’s a new watch that needs servicing, or a vintage piece in need of repair, you can expect high quality, reliable service from Neustaedter’s. Whether it’s a Timex or a Rolex, every watch will need a little attention from time to time. When you bring your watch to Neustaedter’s, you are bringing it to some of the most experienced and trusted hands in the jewelry industry. Even other jewelry stores trust us with repairs for their customers. We are an Authorized Rolex Repair Location. We can repair, and overhaul all high end Swiss Mechanical watches, Rolex, Breitling, Omega, Panerai, Cartier, Movado, Jaeger La Coultre, Zenith, as well as most other popular Swiss Brands. This includes cleaning, adjusting and lubrication of movement. Special finishes on bands can be re-applied, polished, satin, brushed, etc… as per manufacturers original specifications. Battery replacement for both silver oxide and lithuim batteries. These can be done while you wait, most of the time. We install batteries for all watch brands, including Rolex Quartz, Breitling Quartz, Omega, Ebel, Baume & Mercier, and other major Swiss brands. Have an antique or family heirloom watch? Neustaedter’s watch refurbishing capabilities can get it running and refinish the surfaces to make it look and run as new as possible. Includes repair and regulation, cleaning adjusting and lubrication of movement. Crystal replacement, Sapphire, Mineral Glass and plastic all available. We also have the capability to custom cut most crystals not available. Prices and options will be determined at the time of take in. We can also polish scratches out of a crystal, case by case basis. Dial refurbishing. For Dials that have moisture exposure or other damage, we can have the dial refinished or replaced. Reseal and pressure water resistant watches, includes new gaskets and seals for pressure tests to manufacturers specifications. Complete movement replacement. If the original movement can not be repaired, or parts are no longer available, we can install a new movement, on a case by case basis. We can shorten bands on new watches so they fit, this also can be done while you wait in most instances. We can also replace watch pins to connect the band to watch case. Case engraving, If the watch is a gift for a special occasion or event, it can be engraved on the case back to personalize the gift.